On 6 March 1861 the Confederate Provisional Congress established the Army of the Confederate States of America. This army, poorly organized when the war began, was soon overshadowed by the volunteer forces known officially as the Provisional Army. On 28 February and 6 March the Confederate Congress gave the president control over military operations and the power to muster state forces and volunteers. On 8 May it authorized enlistments for the war, and on 8 August, after four more states had joined the Confederacy, it called for 400,000 volunteers to serve for either one or three years. In April 1862, congressmen passed the first conscription act, which drafted men directly into the Provisional Army. The decentralized political structure of the Confederacy forced lawmakers to clarify its military chain of command from the start. On 16 May 1861 the Confederate congress established the rank of general to give Confederate commanders control over state troops. Under an act passed on 28 February 1861, the military gained the power to appoint major generals in the Provisional Army. Finally, in September 1862, Confederate legislators created the rank of lieutenant general in the Provisional Army. The Confederacy faced serious challenges outfitting its troops and planning a vast military campaign throughout the Civil War. The government had little access to modern weaponry and was forced to hire privateers to run the Union blockade and purchase arms abroad. The fledgling government also faced the task of procuring shoes, clothing, and blankets for soldiers at a time when wool and leather were scarce. Furthermore, the region's dearth of railroads and canals made it difficult for the government to ship goods and to feed its troops. The South's weak infrastructure also affected Confederate military strategy. By 1863, horses and mules were scarce, which limited the mobility of the army's cavalry, artillery, and baggage trains. These difficulties were exacerbated by a divided leadership structure that limited prompt coordination between military departments. All of these challenges dictated how Confederate generals would wage war against Union leaders, who could draw recruits from a larger population and enjoyed access to better transportation and resources. Our ACW Confederate Cyber-Roster is UP-to-DATE!!!!!!!! so that we might fix or remove it. Welcome to reenactor.Net's brand new articles section. Here you can post articles on how to improve your civil war impression, handy tips, events you've been too, even Civil War short stories. Let your mind and your pen go free! If you have anything to submit, please send it to Trish Furman-Leve. Thanks and enjoy! A major key to living history impressions today, particularly in the Civil War, has to do with how generic one's impression is. Basically in layman's terms, this means that many units and living historians today make their impressions far too specific. By making one's impression more common, to represent the common soldier, is to greatly improve the impression. Lose corps badges, and excess brass. Documents point out that brass indicating infantry, artillery, and cavalry were not standard issue, and had to be purchased separately by troops. So, the more generic the look, the better. By representing the common solider (unless a specific situation calls for something different) you will greatly improve your impression. Another major facet to improving impression regards kit. After going to many reenactments, one finds that far too many living historians wear their gear wrong. The most common mistake seems to be people wearing their gear too low. In the 1860s troops (and most people in general) wore their pants and belts higher than is common now. To prove this, try marching any distance with your kit hanging low around your waist. Ouch! Do that, and you quickly realize soldiers must have wore their accoutrements high. Also, try and carry all of your kit. This means haversack, bedroll, backpack, tin cup, cartridge box, etc. Soldiers commonly went straight out of the march and deployed straight into battle, so there was not any major setting up of camps to leave their possessions at. Finally, don't overload yourself with gear. Period reports talk a lot about seeing all sorts of items (both issue and personal) scattered all over the roads after the pass of a marching army. Try and make your impression indicate some hard campaigning, which most troops both North and South did prior to battle. Keep in mind when buying your equipment some things to look out for. By learning about sewing and shoes, you can keep a good eye out for what is quality fair and what isn't. Consider learning how to make your own uniform! You never know. In any case, some obvious ways to craft a good impression are to stick to one hundred percent natural materials, particularly wool and cotton. Certain thing like button holes should definitely be hand sewn, not machine sewn! You can get instructions on how to do this practically anywhere now, so no excuses! For buttons, buckles, etc, make sure you don't use stainless steel. Remember, when in doubt, get issue. Many soldiers did not have the luxury of home made or supplementary items (with a few exceptions in the personal belongings department of course, always nice to have some 19th Century toys...) This rule can be bent a little more for Confederate living historians however, whose possessions could usually be a mix of issue and homemade. When in doubt, research! This may sound like a huge, arduous process, but if you search out a few good period pictures you can easily craft your impression to be more authentic. Weapons should also be appropriate for your unit. Unless you have a specific unit impression (Mississippi comes to mind) stick to three-band rifles and remember to authenticate them! This means break out the 'ole sandpaper and varnish and remove the plastic coating that "new" weapons come with. Remember to finish the musket correctly, and of course, modern markings and plates should be replaced with historically correct ones. Your weapon will probably turn out to be the most expensive part of your kit, and one of the most important. This area is crucial in order to improve your Civil War impression. Finally, there are some things one can do personally that will greatly improve the authenticity of any Civil War impression. Firstly, lose weight. This will benefit you in the long term health wise, and it will also make you look more authentic. Most Civil War soldiers were light compared to today's society, but of course, this option of your impression is completely personal. Secondly, keep the hair short. Lice and grime was quite an issue throughout the Civil War, so soldiers in the ranks were forced to keep their hair short to prevent contracting the lice. If your portraying a Southern soldier, you might want to consider making your haircut somewhat dishevelled. Again, this area of your impression depends greatly on how seriously you take the Civil War! Beards are acceptable in a large range of variety and styles, so depending on the time of the year the event your attending is, your unit, and your preference, consider growing a "campaign" beard. Make sure it's authentic by finding a first source in the form of original pictures. Make sure things like modern watches, cigarettes, anything plastic out of your impression completely, or at the very least, hidden away in your haversack. Not everyone will take this to the extreme, and in the end is really a matter of preference. If you wish to carry some modern comforts with you, just don't hang wear them for all to see! These are only a few general suggestions you can use to improve your Civil War impression. This truly is only the tip of the iceberg of information on improving authenticity published today. To improve your impression in all living history areas, just remember two things. One, use common sense. If you follow your gut and try and imitate the pictures, you should turn out alright. Time and experience will allow you to craft your impression to good degrees the longer you stay in Living History. Finally, remember to have fun. This is, after all, not an occupation (though some of us wish it could be, but alas...) So go out there, read up at your library, and enjoy yourself. See you in the field!!! Welcome to reenactor.Net's Civil War sutlery section. Here you can find various the locations of sutlers across North America and what they specialize in. If you have a submission, please send it to us. Thanks!! It''s a place for customers to rate their experiences with vendors servicing the reenacting community. Good or bad, let's hear it. Vendor Feedback Reviews are posted only after reviewed by the webmaster. Positive reviews are posted as they are submitted, negative reviews are posted 2 weeks after submission. During this time, the vendor is sent the review in order to provide them ample time to provide us with a rebuttal. After 2 weeks if no rebuttal is received the review is posted. Vendors who do not recall the buyer are encouraged to make contact and work out the problem. Spread the word! The RCG has not only helped other reenacting time periods by spreading the word about bad vendors and experiences, but it has also really helped new vendors get discovered and their businesses grow. What it really means is that if a vendor screws someone, then it will be out there for everyone to see. And yes, vendors CAN rebut feedback. Be polite, no flames and be professional!! Please, visit some of our fine sponsors! The 58 page monthly newspaper OF reenacting! Smoke & Fire has a calendar for battle reenactments, historical festivals, buckskinner rendezvous, medieval events, Pow-wows, and museum exhibits. This listing covers all over the United States & Canada. Find it in Smoke & Fire! Medieval, 17th Century, French & Indian War, Native American Pow-Wows, Scottish Events, Lectures & Workshops, Revolutionary War, War of 1812, American Civil War, Western Fur Trade, Museum Exhibits and More! Great Cartoons--News--Silly Photos of Your Re-enacting Friends--Information on Organizations--Useful Advertisers! The Smoke & Fire News is your link to Living History Events and Information! 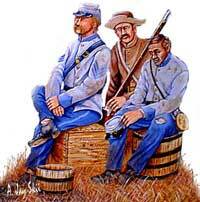 Welcome to reenactor.Net's Civil War Research Sites and Links section. Alas... this page is still a bit weak, but we're working on it! We plan to try and do a thorough rework one of these days, but this is a long slow process, so please have patience. We have checked most of these links and fixed them (well, there might be a bad one or two, but...). We have a LOT more to add! Also, we need some text with each link, so if this is your site, or you can write it for us, please, let us have a paprgraph on each link ;-) Send us the text (and which link it's for to tleve06@yahoo.com. If you have a site we should be listing here, or know of a good Civil War website that we don't list, please fell free to let us know. Better yet, click the link below to use the add-link form! And Please feel free to report all broken links to us. If you know a great Civil War site that isn't listed, or have the new link of a broken one below, please let us know by filling out the form here. Thanks!! !